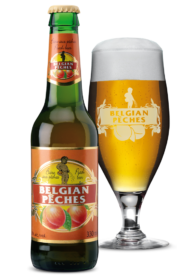 Belgian Pêches is a Belgian Fruit beer, It has coppery color with red highlights, it gives off aromas of peach and exotic fruits, it has an alcohol content of 3.5%. If a brewer had the idea of bringing together the qualities of a white beer and a sun-drenched peach, what would the result be? The answer? Belgian Pêches! Coppery with red highlights, it gives off aromas of peach and exotic fruits such as mango or passion fruit. All these aromas are reflected in a generously sweet flavour. The finish is long, sweet and with no bitter aftertaste, just like a perfectly ripe peach.